P0181 FTT SENSOR (Fuel temperature sensor ″A″ circuit range/performance) A) Rationally incorrect voltage from the sensor is sent to ECM, compared with the voltage signals from ECT sensor and intake air temperature sensor. B) The comparison result of signals transmitted to ECM from each temperature sensor (IAT sensor, ECT sensor, EOT sensor, and FTT sensor) shows that the voltage signal of the FTT sensor is higher/lower than that of other temperature sensors when the engine is started with its cold state. Is it necessary to erase permanent DTC? YES >> GO TO 7. Turn ignition switch ON and wait at least 10 seconds. Is 1st trip DTC detected? YES >> Proceed to EC-256, "Diagnosis Procedure". Select вЂњCOOLANT TEMP/SвЂќ in вЂњDATA MONITORвЂќ of вЂњENGINEвЂќ using CONSULT. 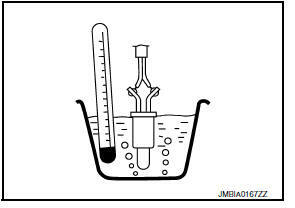 Cool engine down until вЂњCOOLANT TEMP/SвЂќ is less than 60В°C (140В°F). Perform component function check. Refer to EC-255, "Component Function Check". Use the component function check to check the overall function of the FTT sensor circuit. During this check, a 1st trip DTC might not be confirmed. NO >> Proceed to EC-256, "Diagnosis Procedure". Remove fuel level sensor unit. Refer to FL-6, "Removal and Installation". 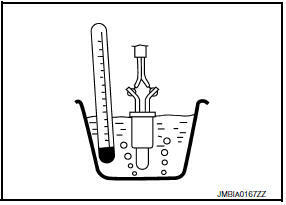 Check resistance between fuel level sensor unit and fuel pump terminals by heating with hot water as shown in the figure. Confirm the detected malfunction (A or B). Refer to EC-254, "DTC Logic". Which malfunction is detected? A >>GO TO 2. NO >> Proceed to MWI-58, "Diagnosis Procedure". Check the voltage between fuel level sensor unit and fuel pump harness connector and ground. Check the continuity between fuel level sensor unit and fuel pump harness connector and ECM harness connector. Check the FTT sensor. Refer to EC-257, "Component Inspection".